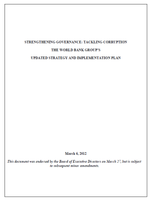 MEMOFIN - Strengthening Governance, Tackling Corruption : The World Bank Group’s Updated Strategy and Implementation Plan - L'information financière que vous ne trouvez nulle part ailleurs ! Strengthening Governance, Tackling Corruption: the World Bank Group’s Updated Strategy and Implementation Plan will focus on increasing and systematizing governance and anti-corruption work in country and sector programs; strengthening country institutions; better measuring results from programs and policies; managing risks; supporting governance in global initiatives; and improving the organization of the Bank’s internal resources for governance work. The update builds on the successes and lessons learned from the 2007 strategy, Strengthening World Bank Group Engagement on Governance and Anticorruption (GAC), in order to meet the challenges presented by fundamental changes that have happened around the world since then. In particular these changes include the financial crisis; greater citizen demands for transparency, accountability and participation --as evidenced by the Arab Spring-- and a more open and transparent World Bank (see factsheet). In addition to strengthen governance and anti-corruption work in client countries, the updated strategy focuses on better measuring results and the development impact of Bank-funded programs and projects. Further, the Bank is strengthening its management of risk while at the same time applying a zero tolerance policy for fraud and corruption. The Bank has now debarred 485 firms, individuals, and non-governmental organizations, preventing them from participating in future Bank-financed projects, through its Integrity Vice Presidency (INT), which has ramped up its work in the last few years to reduce the risk of fraud and corruption in projects. In addition, the Bank has become more open and transparent. It has been actively working on a number of Open Development initiatives like the ‘Mapping for Results and Aidflows’ website to promote better monitoring of project results, enhance transparency, and strengthen country dialogue and civic engagement. Up to the end of 2011, the Bank had made available to the public 42,000 new documents since the Access to Information Policy became effective in July, 2010.